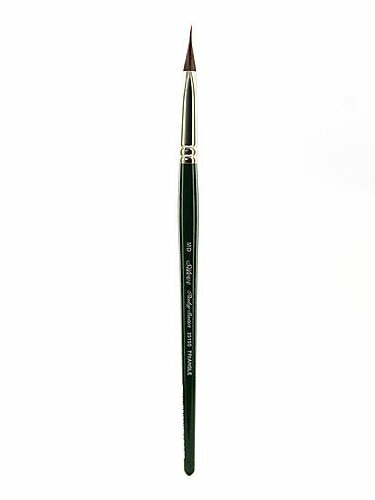 Ruby Satin short handle pointed triangle shape brush. These brush are made of 100 percent interlon filament. This is tough and very long lasting. The revolutionary synthetic with the control and feel of interlocked bristle, and more durable than natural hair. Use Ruby Satin on rugged textured surfaces. Paint with confidence on wood, canvas, or tough fabrics like sweats, jeans or heavy cotton. Ruby Satin offers superb color control with heavy body, tube, or jar acrylics, oils, gouache, encaustic or casein. Perfect for blending, double loading, layering and stroke work. Silver tipped, deep green polished handles. Available in medium size. Measures 8-1/2-inch length by 3/7-inch width by 3/7-inch height.